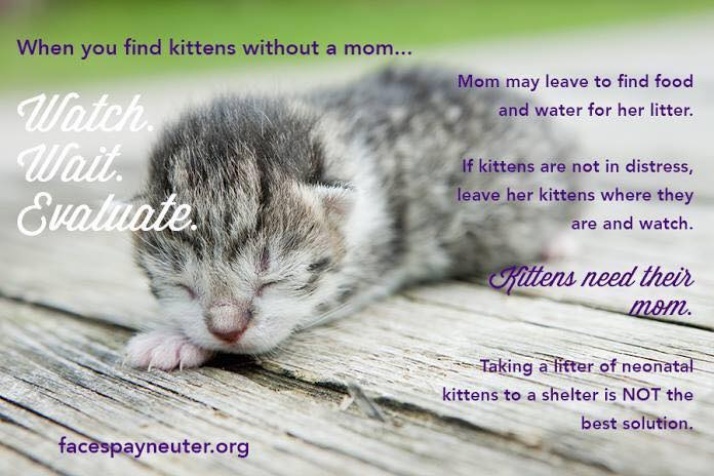 Don’t be a kitten-napper! If you find a pile of kittens, your first instinct may be to scoop them up and save them but there is a very good chance mom is out getting food or taking a moment for herself. Mom does not stand over her babies all the time. Observe the litter of kittens and wait to see if she returns. Taking these kittens so small may cause them to die. Even the best of foster parents lose neonates because they are so fragile. The Cat Mom is ALWAYS best!